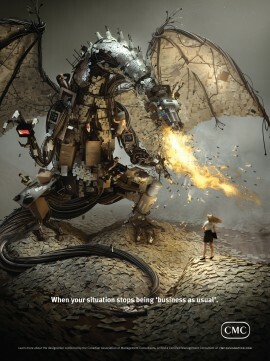 The Canadian Association of Management Consultants or CMC-Canada launched an advertising campaign in 2014 with an image that depicts consultants as facing a fire breathing dragon made up of paperwork, old systems with a few disgruntled employees thrown in if you look closely. While most consulting engagements don’t involved dragon slaying everyday, it is true that the dragon represents many of the reasons why corporations hire outside, independent business consultants. CMCs are trained to take a process oriented and analytical approach to business problems which helps take emotional reactions and gut feelings out of decision-making. And CMCs have years of specific business experience which helps them know exactly what type of dragon they are dealing with and what type of blow back to expect. Business as usual is not the time to hire a CMC. When you have a dragon sneaking up on you, affecting operations, morale and profit, find a professional business advisor. Call a CMC. We are accustomed to the heat. Terry Rachwalski is a business advisor providing business development and marketing advise to technology firms in British Columbia. You can follow business consulting firm, Front Porch Perspectives on Google Plus. Clearly the most web savy consultant in Victoria BC!!! Why thank you Miss Jenn.